Discover the comfortable and accessible wines from Côtes de Bordeaux. The Côtes de Bordeaux falls outside of the five classified hierarchies in Bordeaux, the most obvious of those being the 1855 classification, but also including one for Graves, one for St. Émilion, the Crus Bourgeois, and Cru Artisan. The Côtes are a collection of four regions that have banded together under the appellation name. “Côtes” translates to slopes and “Bordeaux” literally means “the side of the water.” The Côtes de Bordeaux are hillside vineyards, mostly south or southeastern facing, on the right bank of the Garonne and Dordogne rivers. 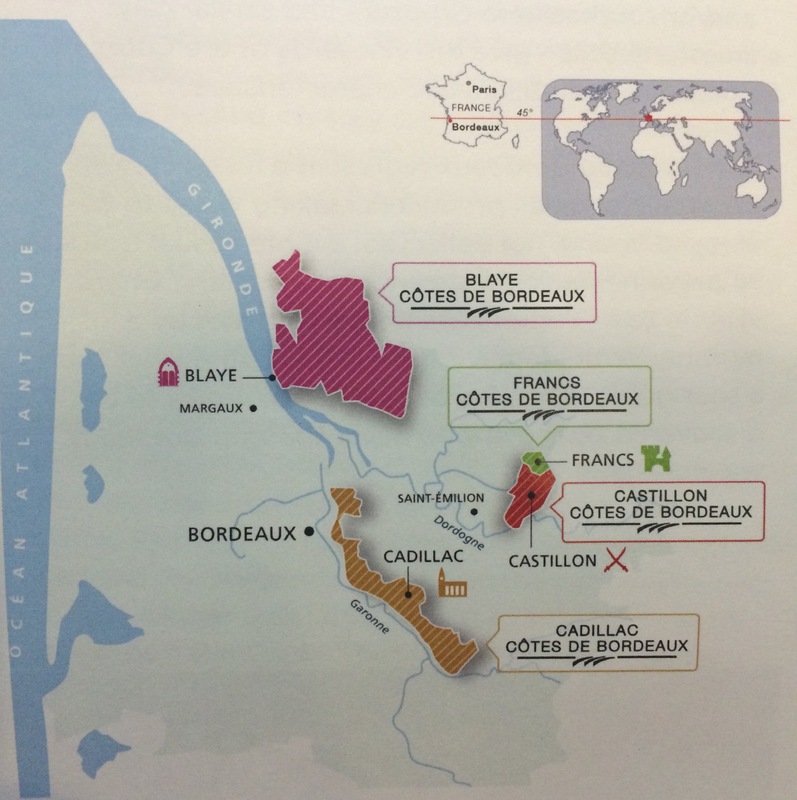 The four regions, in order of size, include Blaye, Castillon, Cadillac, and Francs. Frankly, the appellation is much more about camaraderie and marketing nomenclature than it is about geology and terroir (i.e., 50 miles separates northern Blaye from southern Cadillac, not mentioning the fact that they are on different rivers). That said, what the regions do have in common is they tend to produce accessible wines, both in terms of profile and price, which are perfectly suited for everyday. A la jeans. In total, the Côtes de Bordeaux makes 5.5 million cases annually (of the 57 million in Bordeaux) from 941 producers (of the 6,800 in Bordeaux). Blaye: Northernmost region – just across the Gironde from Margaux and Saint-Julien. Blaye’s history dates back 2,000+ years when it was a prized Roman vineyard. Limestone cliffs and some clay. Castillon: Ridges and plateau of limestone as you move away from the Dordogne. Here you’ll find very similar, but sometimes higher elevation terroir than Saint-Emilion. Closer to the river, the soil is predominantly clay with sand. Francs: Pale limestone clay soils with several high elevation plots. 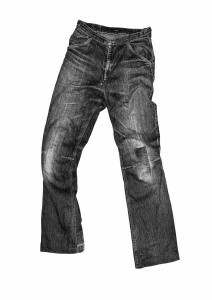 Dry continental climate with cold winters and hot, sunny summers. Only 46 wine producers in this small region. Cadillac: Southernmost region in the Cotes de Bordeaux appellation, lining the shore of the Garonne. Limestone (sometimes below shallow loam), a variety of clays (including a thick blue clay like in Pomerol) and stony, fine gravel. It’s warmer and sunnier here, which makes the reds more susceptible to rot, so it’s difficult to always let the grapes hang long enough to ripen in the acidic limestone soil. A perfect bistrot wine. Round and plump, but enough acidity to match food. Dark plummy perfume and a rich palate. Biodynamic estate. A fun wine – 100% Merlot grown on limestone soil. Semi-carbonic maceration, all stainless steel. Serve it slightly chilled with the end-of-summer dishes. Organic. Packed with peppery spice and begging for simply prepared meat. 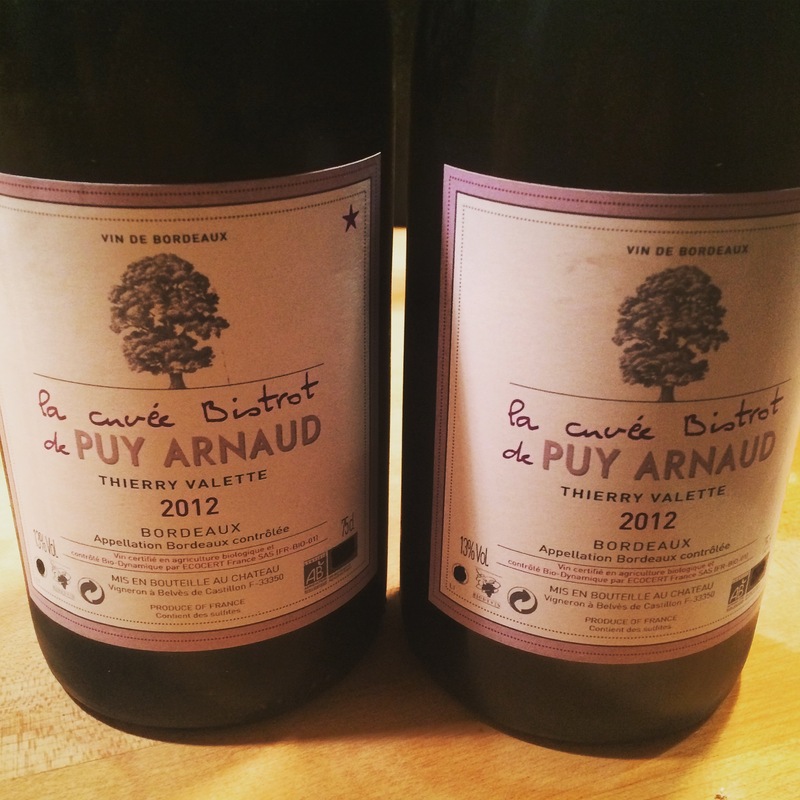 Juicy and easy to drink with a nice vein of minerality. * In full disclosure, I wrote this article before I started a new job, but I’m now working for a Bordeaux negociant and importer.